Aga Khan To Receive Honorary Canadian Citizenship - 2009-06-19 | Ismaili.NET - Heritage F.I.E.L.D. The Honourable Mobina S.B. Jaffer, Q.C. The Honourable Marcel Prud’homme, P.C. “Today, on the advice of our Government, the House of Commons voted to bestow Honorary Canadian Citizenship upon His Highness the Aga Khan. 9 June, 2009, Edmonton, Canada - The University of Alberta and the Aga Khan University today signed a memorandum of understanding that advances their respective goals to increase global engagement and to promote equitable human advancement and social justice throughout the world. OTTAWA -- Parliamentarians have voted to grant the Aga Khan honorary Canadian citizenship in what the prime minister describes as a recognition of his leadership in promoting "development, pluralism and tolerance around the world." Honorary Canadian citizenship is bestowed by the Governor General and requires the unanimous approval of all voting MPs. Born in Geneva, Shah Karim al-Hussayni is the fifth person to be named an honorary Canadian citizen. OTTAWA (AFP) — Prime Minister Stephen Harper on Tuesday proposed extending honorary Canadian citizenship to the Aga Khan, imam of the world's Shia Ismaili Muslims. Harper said his government would seek "the consent of the House (of Commons) to extend honorary citizenship to His Highness," and urged all parliamentarians to support the motion. The Aga Khan, Prince Karim Al Husseini, 72, is the spiritual head of the world's 15 million Ismaili Muslims. He is the forth such person to hold the post since the 19th century. OTTAWA - Canada will grant the Aga Khan honorary citizenship for what Prime Minister Stephen Harper describes as his exemplary humanitarianism and long friendship with Canada. Born in Geneva, Shah Karim al-Hussayni is the 49th hereditary imam of the Shia Ismaili Muslims and is widely recognized for his work against poverty and his promotion of tolerance. Now 72, he is the founder and chairman of the Aga Khan Development Network, which works in Asia and Africa and is one of the world's largest private development networks. OTTAWA — Canada will grant the Aga Khan honorary citizenship for what Prime Minister Stephen Harper describes as his exemplary humanitarianism and long friendship with Canada . Born in Geneva , Shah Kari al-Hussayni is the 49th Aga Khan, or imam to Shia Ismaili Muslims, and is widely recognized for his work against poverty and his promotion of tolerance. 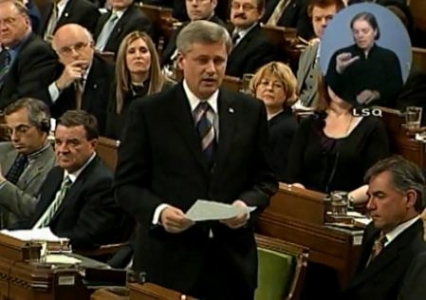 Stephen Harper, the Prime Minister of Canada, announces during Question Period that the government will be seeking to grant the Aga Khan honorary Canadian Citizenship. First off I think I speak on behalf of all members in congratulating His Highness the Aga Khan in receiving an Honorary Doctorate today from the University of Alberta today.